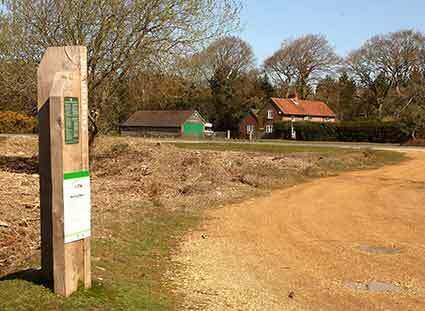 Bramshaw Telegraph, beside the B3078, Fordingbridge road, 5 kilometres (3 miles) north-west of Brook, is one of the highest points in the New Forest at 128 metres (419 feet) above sea level. In the 19th century it was the site of an optical shutter signal station, one in a line that linked Plymouth with the Admiralty in London. Devised by Lord George Murray, the stations operated from 1806, and were used primarily during the Napoleonic Wars to send messages at speed. A similar system was used between London and Portsmouth. The stations were manned by a naval officer and two ratings who sent signals by opening and closing six shutters in a vertical frame. Powerful fixed telescopes trained on adjacent stations in the line were used to read the signals, which were then sent on. Messages took about 20 minutes to get from London to Plymouth. To operate successfully, the stations needed a clear line of sight one to the other, and in the event of poor visibility, messages were carried by a rider on horseback. The stations either side of Bramshaw Telegraph were at Toot Hill, near Rownhams, where Telegraph Wood can still be found, and on Pistle Hill, across the county boundary in Dorset. The buildings were of wood, and none today survive. That at Bramshaw Telegraph is believed to have been close to Hope Cottage. Buildings associated with a similar, slightly later system can be found elsewhere in Hampshire – at Farley and Sherfield English, for example.